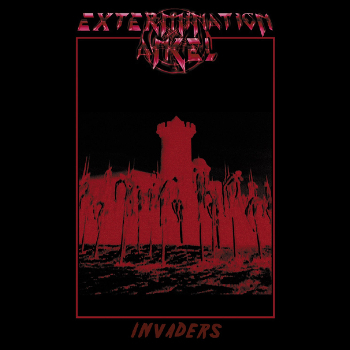 The new Extermination Angel demo for 2017 is entitled Invaders, and the speakers are invaded when you press “play” to be sure. The band’s bio describes Extermination Angel as “ancient death metal for only the most dedicated fiends of the mid- to late-‘80s and early ‘90s international extreme underground” and that sounds right. We last wrote about Extermination Angel when we reviewed their 2012 album, but the music and vocals continue to be obnoxious and old school, with grating production values, which works well for the band. And the demo features a song called “Leather Belt Soup,” so you can’t go wrong here. The demo is up on Bandcamp for, of course, $6.66, but if you get the tape instead, there’s two bonus songs for the enjoying. Baltic Warlord Records released the demo in March, and the tape is limited to 100, so get ’em while they’re infernal.